If you are looking to work in the field of business, you may have noticed that a number of high paying jobs require some years of experience. Employers want to see that you got your feet wet, contributed to a team, and have learned how to manage your own work while supporting the ethos of a workplace. But how do you get those first jobs? Do you start with an MBA in project management? We don’t think so. To get the on-the-job hours, you’ll want to consider something a bit faster- an associate’s degree in project management. Often times, you will learn everything you need to from a 2-year program and those years on-the-job. Not only that, but an associate’s degree in project management is far more cost effective than an MBA. You’ll learn how to talk in public, engage with micro and macroeconomics, manage a team, brand yourself, maximize sales, and of course manage a business. We selected programs based not only on their affordable tuition rate, but also their quality of academics. We measure quality partially by the curriculum but also how well students are actually engaging with the curriculum. So, graduate rate, retention rate, and student-to-faculty ratio where all considered when organizing our academic score. Most programs are 60 credit hours and require about 2 years of your time. 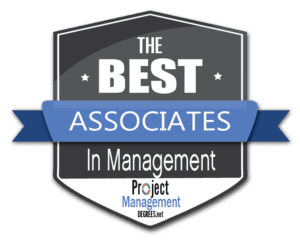 Compare that to the 6 or 8 years of time it would require for you to finish your MBA, and you’ll see why an associate degree in project management is a smart choice. Alvin Community College is a public 2-year institution located in Alvin, Texas. There are 5,785 students enrolled, and the student-to-faculty ratio is 14:1. The Southern Association of Colleges and Schools accredits Alvin College to award associate’s degrees and professional certifications. Their student support services include tutoring, academic counseling, and on-campus day care. According to Carnegie this is a mixed transfer and vocational/ technical school. Their programming includes academic degrees in business, education, culinary arts, psychology and more. The college offers 5 online degrees and certifications. Alvin College offers an Associate of Applied Science in Management. This online degree requires 60 credit hours to complete and costs less than $4,000 per year. Along with your general education requirements, you will study Principles of Marketing, Communications in Management, Human Relations, Business Administration and Management, Business Computer Applications, Small Business Management, Human Resources Management, Advertising and Sales and more. If you need and introduction to project management, this online associate’s degree is a great option. North Hennepin Community College (NHCC) is a 2-year institution located in Brooklyn Park, Minnesota. There are 6,550 students enrolled, and the student-to-faculty ratio is 24:1. The Higher Learning Commission accredits NHCC to award associate’s degrees and professional certifications. Their support services include tutoring, academic and career counseling, and credit for life experience. Carnegie Lists NHCC as a high transfer institution. Their academic offerings are wide ranging including programming in business, education, engineering, and more. The college currently offers over 30 online degrees and professional certifications. NHCC offers an online Associate of Science in Business Administration, an Associate of Applied Science in Finance Management, AAS in Management, and and AAS in Marketing. We like NHCC for the wide selection of programming and career options. Their programming is affordable– with an average tuition cost at about $4,400 per year. 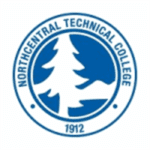 Northcentral Technical College is a public two-year institution located in Wausau, Wisconsin. There are 5,167 students enrolled, and the student-to-faculty ratio is 15:1. The Higher Learning Commission accredits NTC to award associate’s degrees and professional certifications. Their student support services include tutoring, academic and career counseling, and credit for life experiences. When it comes to academic programming, NTC offer a wide range of programs from agriculture and dairy science to cinematography and sign language interpretation. Currently there are over 50 academic programs available online. NTC offers an Online Associate Degree in Business Management. The program requires 62 credit hours to complete and will take about 2 years. Students study general education classes and core subject material with a focus in human resource management, accounting, management, leadership, communication, and more. This program is a great fit for individuals looking to initiate their career in project management, or transfer into a 4-year program. Richland College is a public 2-year institution located in Dallas, Texas. There are 18,794 students enrolled, and the student-to-faculty ratio is 26:1. The Southern Association of Colleges and Schools accredits Richland College to award associate’s degrees and professional certifications. Carnegie classifies Richland as a high-transfer college which is apparent in their academic offerings. When it comes to academics, Richland offers rigorous programming in business, education, engineering and more. The college offers remedial help, academic and career counseling, and credit for life experience to help support student success. Richland College offers an Associate of Applied Science in Management. We selected this online degree for the affordable tuition rate and high quality of the academic programming. The approximate cost for tuition is $5,083 per year. In addition to general education courses, this AAS requires programming with a core focus on management, including: principles of macroeconomics, principles of marketing, problem solving and decision making, small business, entrepreneurship, human resources management, organizational behavior, and so much more. This versatile program both readies you for the workplace and advancement to a 4-year program. Northeast Iowa Community College (NICC) is a public 2-year college located in Calmar, Iowa. There are 4,536 students enrolled, and the student-to-faculty ratio is 12:1. The Higher Learning Commission accredits NICC to award associate’s degrees as well as professional certifications. NICC offers the full gamut of student support services including credit for life experiences, remedial services, and academic and career counseling. When it comes to academic offerings, NICC provides a wide range of programming for traditional and nontraditional students including in agriculture, business, welding, massage therapy, engineering and more. There are currently 6 degrees and certifications available online. NICC offers an online Associate of Applied Science in Business, Marketing, and Hospitality. This online degree requires a minimum of 47 credit hours to complete. The college allows for 28 transfer credit hours. The program includes course material in management, business, computer business Apps, business ethics, managerial accounting, and more. If you are ready to initiate your career in project management, this program is a great option. Northland Community and Technical College is a public 2-year college located in Thief River Falls, Minnesota. There are 3,416 students enrolled, and the student-to-faculty ratio is 18:1. The Higher Learning Commission accredits NCTC to award associate’s degrees, and professional certifications. To support student success, NCTC provides tutoring, academic and career counseling, and credit for life experiences. The academic offerings are wide ranging including programming in military science, welding, massage therapy, customer service management, and crop production. There are currently 19 degrees available online. Northland Community and Technical College offers an online Associate of Applied Science. This online degree requires just 60 credit hours to complete. The course material includes sales, marketing, and management. Like with most 2-year degrees, students are required to complete general education classes as well as core courses. The core courses include advertising, marketing, sales, small business management, applied sales techniques, and electives. The electives are a nice opportunity to tailor your degree to match your career interests. State Fair Community College (SFCC) is a public 2-year college located in Sedalia, Missouri. There are 4,742 students enrolled, and the student-to-faculty ratio is 19:1. The Higher Learning Commission accredits SFCC to award associate’s degrees and professional certifications. Carnegie ranks SFCC as a high transfer mixed vocational/technical school. Their academic offerings you may have guesses include a wide range of programming for both students following a direct career path or for those who wish to transfer into a 4-year program. Some of their programs include engineering, computer programming, business administration and management, nursing, chemistry, and criminal justice. Their support services include tutoring and credit for life experience. There are currently nearly 30 degrees and professional certifications available online. SFCC offers an Associate of Applied Science in Business Management with a Management Specialty. This online degree is a great fit for individuals looking to initiate their career or transfer into a 4-year institution. The program requires 64 credits for completion and has an estimated annual tuition of $5,640. The degree is divided into 5 main components: written and oral communication, mathematical sciences, sciences and fine arts, program core, and electives. The electives certainly add flexibility to this program. Your core courses include accounting, managerial accounting, business, customer service management, business strategies, personal finance, and employment strategies among others. Lakeshore Technical College is a public 2-year college located in Cleveland, Wisconsin. There are 2,734 students enrolled, and the student-to-faculty ratio is 13:1. The Higher Learning Commission accredits LTC to award associate’s degrees as well as professional certifications. Their student service programs include academic counseling, career counseling, remedial services, and credit for life experiences. Carnegie classifies the institution as a high-vocational, and high-technical and high-vocational school. To support student success, LTC offers tutoring, academic and career counseling, and credit for life experiences. This technical-vocational school offers academic programming in agriculture, business,education, engineering, nuclear power, health, and much more. There are currently 17 online degrees and professional certifications available. LTC offers an online associate’s degree in business management. This is a 60 credit hour program. There are two start dates: August and January. The estimated cost for tuition is $6,167. Like with most 2-year degrees, students divide their time between general education courses and core courses. 33 credit hours are devoted to the core material which includes course work in: managerial accounting, business accounting, global business, business management, marketing, and branding, and others. Students may opt to pursue a business management internship. North Central Missouri College is a public 2-year institution located in Trenton, Missouri. There are 1,832 students enrolled, and the student-to-faculty ratio is 21:1. The Higher Learning Commission accredits NC Missouri to award associate’s degrees and professional certifications. Carnegie classifies NC Missouri as a mixed vocational and traditional institution. The academic offerings include programming in marketing, information technology, welding, the liberal arts, criminal justice and more. To support student success the college offers tutoring and credit for life experience. Nearly 30 of their programs are offered online. NC Missouri offers an Associate of Applied Science in Business and Technology with an Emphasis in Management. This is a 65 credit hour program that requires 2 years to complete. This is a comprehensive program that provides options for students looking to transfer their degree or initiate their career in project management. The program includes coursework in human resource development, entrepreneurship, business communications, business nlaw, microeconomics, and a business management internship. Fox Valley Technical College (FVTC) is a public 2-year institution located in Appleton, Wisconsin. There are 11,660 students enrolled, and the student-to-faculty ratio is 12:1. The Higher Learning Commission accredits FVTC to award associate’s degrees and professional certifications. The university offers remedial help, academic and career counseling and credit for life experience to support their student’s success. When it comes academics, FVTC offers a huge number of programs for vocational and traditional students including programs like an associate in accounting, certification in graphic design, associate’s degree in forensic science and technology, and a pilot’s certification. There are currently 14 online programs available. Fox Valley Technical College offers an Associate of Applied Science in Business Management. This is an accelerated 60 credit hour program that prepares you to enter the field of project management. You could pursue a career as an office manager, customer service supervisor, team leader etc. There are 6 different specialty tracks available: global, marketing, general, entrepreneurship and more. Your track dictates the focus. We like this program for the affordable tuition rate, and high number of specialty tracks- giving you the ability to tailor your program to match your degree. 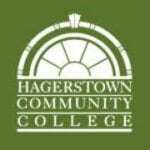 Hagerstown Community College is a public 2-year institution located in Hagerstown, Maryland. There are 4,069 students enrolled, and the student-to-faculty ratio is 17:1. The Middle States Commission on Higher Education accredits Hagerstown Community College to award associate’s degrees and professional certifications. The college supports its students with tutoring, employment opportunities for students, academic counseling, and credit for life experiences. Carnegie classifies Hagerstown Community College as a mixed transfer/ vocational college which is apparent in their academic offerings that include accounting, management, mechanical engineering, early childhood education, criminal justice and more. HCC currently offers 10 online degrees and professional certifications. HCC offers an online Associate of Applied Science (A.A.S.) in Management. This online degree requires 60 credit hours to complete and includes general education programming, business management, and a wide range of electives. Students study economics, management, microeconomics, macroeconomics, accounting, the legal environment of business, diversity, and more. The approximate cost of this program is just $6,918 per year. If you are looking for a high-quality associate’s degree in project management that can both lead to a career in project management and transfer to a bachelor’s degree, this is a great option. Mercer County Community College (MCCC) is a public 2-year institution located in West Windsor, New Jersey. There are 7,630 students enrolled and the student-to-faculty ratio is 17:1. The Middle States Commission on Higher Education accredits MCCC to award associate’s degrees and professional certifications. The student support services include remedial support, academic counseling, career counseling, employment opportunities for students and credit for life experiences. Carnegie classifies MCCC as a traditional/ high transfer institution. Their academic offerings are vast including associate’s programs in ornamental horticulture, game design, public health, the liberal arts, nursing, photography, engineering, and tourism management. MCCC currently offers 4 online associate’s degrees. MCCC offers an online Associate of Applied Science in Business Management. This 64-credit-hour degree combines both general education and business management courses. Students of the program may choose to either study full or part time. There are four concentrations available: business systems, management,entrepreneurship, and software. At the end of the degree you will be able to engage with business accounting, manage a business, communicate with teams and more. The program includes computer literacy skills. Whether you hope to head into the workforce or on to a bachelor’s degree in project management, the online associate’s degree in business management from MCCC is a great start. Mesa Community College (Mesa CC) is a public 2-year college located in Mesa, Arizona. There are 20,424 students enrolled, and the student-to-faculty ratio is 21:1. The Higher Learning Commission accredits Mesa CC to award associate’s degrees and public certifications. To support student success Mesa offers the full gamut of services for its students including tutoring, academic counseling, career counseling, employment opportunities, as well as credit for life experiences. Carnegie classifies MCC as a mixed traditional and nontraditional college which is certainly reflected in their academic programming. Their academic offering are wide-ranging and vast including programming in computer graphics, landscaping, early childhood education, linguistics, and project management. MCC offers and impressive 25 online associate’s and professional certifications. MCC offers an online Associate of Applied Science in Organizational Management. This online degree is unique in that students may custom-design their programming to match their career goals and needs. The curriculum also reflects the current needs in today’s workplace. This is both a career and a technical degree. Students have the opportunity to study business communication, human relations in business, management and leadership, accounting principals, and project management in quality organizations. This program offers programming for students with diverse interests. Rio Salado College is a public 2-year university located in Tempe, Arizona. There are 17,635 students enrolled, and the student-to-faculty ratio is 30:1. The Higher Learning Commission accredits Rio Salado College to award associate’s degrees and professional certifications. The college offers student support services that include academic and career counseling and tutoring. This is a high vocational and technical college that offers programming in high demand fields like business, education, health, family counseling, construction, engineering, and more. There’s a wide selection of programs available online including their online associate’s in organizational leadership, online associate’s in computer information science, and online associate’s degree in business management and marketing. Rio Salado College offers an Associate of Applied Science in Organizational Management. We selected this online associate’s degree for the high quality of the academic programming and for the affordable tuition which on average is about $7,800. This 64-credit-hour program includes course material in human relations in business, business, business communications, business organization and management, and project management in quality organizations. This is a great program for any individual looking to initiate their career in project management or continue on their education journey with a Bachelor’s in project management. American River College (ARC) is a public 2-year institution located in Sacramento, California. There are 31,858 students enrolled, and the student-to-faculty ratio is 27:1. The Western Association of Schools and Colleges Accrediting Commission for Community and Junior Colleges accredits ARC to award associate’s degrees and professional certifications. Carnegie classifies ARC as a high-transfer/ high-traditional college which is evident in their academic programming. ARC offer a wide-range of academic offerings including extensive programming in the fields of business, communication information sciences, health and engineering. There’s also programming in the liberal arts, foreign languages, social sciences, and visual and performing arts. There are currently 8 degrees and professional certifications available online. ARC offers an Associate of Arts in Small Business Management. This online program requires just 34 units to complete and is a great fit for any individual looking to run their own small business or continue on to pursue a bachelors’ degree in project management. Students will study fundamental of college accounting, business management, business law, principles of macroeconomics, business law, and more. Some of their elective courses include: business planning, marketing for small business, financing a small business, essential records for the small business, management skills for the small business, customer service, retailing and merchandising for the small business, and selling techniques for the small business. Tulsa Community College (Tulsa CC) is a public two-year institution located in Tulsa, Oklahoma. There are 16,897 students enrolled, and the student-to-faculty ratio is 18:1. The Higher Learning Commission accredits Tulsa CC to award associate’s degrees and professional certifications. To support student success, Tulsa CC offers tutoring, academic counseling, career counseling, opportunities for employment, and credit for life experiences. Carnegie classifies Tulsa CC as a mixed transfer for both traditional and nontraditional students. When it comes to academics Tulsa CC’s most robust programs are in the fields of business, engineering and health. Though the college also offers a wide-range of programs including in the visual arts, agriculture, education, foreign language, and the humanities. Currently Tulsa CC offers 27 online degrees and professional certifications. Tulsa Community College offers an Associate of Applied Science in Management. The course requires just 60 hours for completion and is divided into four main component parts: general education classes, electives, management specialization courses, and core course material. The management component of this program includes leadership development, organizational behavior, business policy, principles of management, and human resources management. There are also two marketing classes: customer service, and principles of marketing. This well-rounded program is a great option for anyone looking to head into a management position or continue their education. Fayetteville Technical Community College (FTCC) is a public 2-year institution located in Fayetteville, North Carolina. There are 11,660 students enrolled, and the student-to-faculty ratio is 19:1. The Southern Association of Colleges and Schools accredits FTCC to award associate’s degrees and professional certifications. To support their students the college offers tutoring as well as academic and career counseling and credit for life experiences. This is a high-transfer mixed traditional and non-traditional institution that offers a wide range of degrees. Some of their most robust programs are in the fields of business, computer and information sciences, and health. Though there are a number of technical and vocational programs as well including in fields like the culinary arts, homeland security, child development, and funeral services. The college offers nearly thirty different online associate’s degrees and professional certifications. FTCC offers an online associate of applied science in business administration with a focus on operations management. The program takes two years to complete and requires the completion of 66-credit-hours. Students will study business law, principles of management, logistics quantitative literacy, microeconomics, quality management, and operations management. The program requires general education courses, core courses, and electives we like this program for the high quality of academic programming and for the affordable tuition rate. Tuition for this online associate’s degree is approximately $8,692. Portland Community College (PCC) is a public 2-year university located in Portland, Oregon. There are 28,005 students enrolled, and the student-to-faculty ratio is 21:1. The Northwest Commission on Colleges and Universities accredits PCC to award associate’s degrees and professional certifications. To help students succeed, PCC offers tutoring services, academic counseling, career counseling, employment opportunities, and on-campus daycare for students’ children. PCC offers academic programming for a wide range of interests and needs- for both traditional and nontraditional student and includes programming in real estate, computer programming, word processing, entrepreneurship, mechanics and so much more. In fact there are literally hundreds of programs available. There are currently 7 degrees available online. PCC offers an online Associate of Applied Science in Business Management. The program is 64 credit hours in length and will take about 2 years to complete. Like with most associate’s degree programs student will complete general education courses in addition to their courses in business management. Among the several core courses students will study human resource management, personal finance, managerial accounting, Nonprofit finance, management and accounting and business law. This is a great course for any individual looking to start their career in project management. Minnesota West Community and Technical College (MN West) is a public 2-year institution located in Granite Falls, Minnesota. There are 3,162 students enrolled, and the student-to-faculty ratio is 18:1. The Higher Learning Commission accredits MN West to award associate’s degrees as well as professional certifications. To support student success, MN West offers academic counseling, career counseling, tutoring, and credit for life experience. When it comes to academics the college offers a wide range of programs including in fields like agriculture, business, mechanics, engineering, health and more. There are currently 32 online degrees and professional certifications. MN West offers an online Associate of Science in Business Management. We selected this program for the high quality of academic programming and for the affordable tuition rate. The cost for tuition is approximately $10,838. In addition to 30 credit hours of general education classes students will study the following business classes: principles of accounting, principles of management, principles of marketing, and electives. The electives are in business management, professional selling, business law, business communications, human resources management and principles of microeconomics. Tidewater Community College is a public 2-year institution originally located in Norfolk, Virginia. Currently over 22,000 students call the college home, all at the undergraduate level. The student-to-faculty ratio is 21 to 1. The college has grown over the last 50 years to include 4 regional campuses in Chesapeake, Norfolk, Portsmouth and Virginia Beach, as well as 7 regional subject-specific centers. These subject-specific centers include a health professions center, a technology center, a veteran’s education center, a visual arts center, a workforce preparedness center, and an automotive center. The college is known for many practical degree programs, affordable tuition, and servicemember support. The fully online associate of applied science in management offered by Tidewater Community College is a quality choice for those looking to complete the first two years of their undergraduate education for less than the price of one year at a 4-year institution. The program offers flexibility, particularly for regional students, who may elect to pursue coursework online, at night courses, or as full-time day students. All three tracks require 4 semesters of full-time study. Coursework includes accounting, management, micro and macro economics, marketing, organizational behavior, statistics, and business law. This wide-ranging curriculum is second to none that we surveyed for this ranking. Coupled with Tidewater Community College’s amazing support services and affordable tuition, TCC makes a great choice for associates-level management students.